This edition of Tuesday Game Room comes in a stunning 1080p, with all new texture work, a modified lighting engine, and new hair physics - all in 60 Frames Per Second! Join us, why don't you, for this HD-HD Remix of Tuesday Game Room! Aside from chugging along in World of Warcraft again, most of my time this week has been spent not really playing games. There's nothing really coming out for a while - probably not till InFamous in March - that I really want to play, so I've found myself watching people play games more than I've been playing them. It's an interesting way to get a gaming fix without actually playing something... although I'd much prefer to have something grab my attention. Wherefore art thou, new videogames? 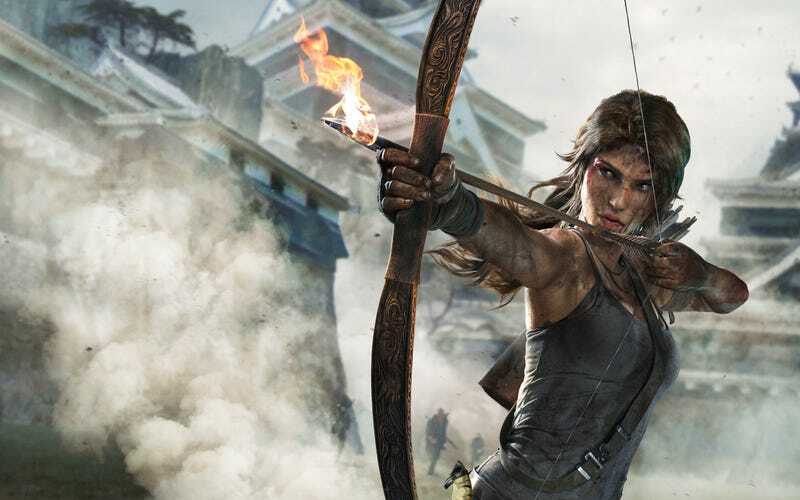 Tomb Raider: Definitive Edition leads the charge for this last week of January, bringing last year's popular Tomb Raider Reboot to the Xbox One and Playstation 4, but that's not all - it's quite a week for the PC too. The previously mobile-only indie strategy title Rymdkapsel gets a port to PC, Rekoil makes its way to steam, and the previously backer-only Broken Age gets a wider release - but perhaps the best news is that Cephalopod fatherhood simulator Octodad: Dadliest Catch finally comes out, with a PS4 release due in the near future. Bringing up the rear is the latest in the long line of Dragon Ball Z fighting games, the creatively titled Dragon Ball Z: Battle of Z, on Xbox 360, Playstation 3 and PS Vita. A not-so-secret surprise: Titanfall is getting a beta - After the leak of closed Alpha footage the other week, Respawn have confirmed that their much anticipated sci-fi shooter will receive a beta on PC and Xbox One (sorry, people interested in the 360 version!) next month. Standby for Titanfall and all that jazz. Microsoft buys out the Gears of War IP - Black Tusk Studios (who wowed at E3 with their short in-engine teaser for an untitled project that has now unfortunately been revealed as nothing more than a concept rather than an actual game) will now handle Epic's esteemed shooter franchise, which is now firmly under the control of Microsoft. Can a next-gen Gears alleviate some of the tiredness of the franchise after the ho-hum Judgement last year? We'll have to wait and see. Candy Crush dev Trademarks 'Candy' and 'Saga', madness ensues - Hoo boy, this is a weird one. King, the development team behind the Candy-filled social game hit have been in the news this week for aggressively policing their new ownership of the seemingly arbitrary words 'Candy' and 'Saga', culminating in a bit of internet rage after it was revealed that they had roadblocked the trademarking of Stoic's recent hit The Banner Saga - their lawyers citing that consumers would somehow be unable to tell the difference between a match-three game and a fantastical Nordic strategy RPG. I mean sure, trademarks have to be defended in order for the IP holder to retain them, but do we really need trademarks for such arbitrary words? Former Assassin's creed Dev accuses Shadow of Mordor of stealing code - Well, those accusations of the new Lord of the Rings game being an AC clone might be a little closer than you think, if claims from AC2 Designer Charles Randall are true. The newly revealed gameplay teaser for Middle-Earth: Shadow of Mordor from last week featured protagonist Talion scaling walls, rope-walking and air assassinating orcs like he followed the Creed, sure, but neither Warner Brothers or Ubisoft have yet to make an official statement regarding Randall's comments.